Outdoor shower, koi pond, and new spring flowers coming up! State of the art jungle gym! This professionally landscaped 4 bedroom, 2.5 bath home is situated on a 1/2 acre in an extremely quiet cul de sac in the highly desirable north side of 6A in Dennis Village area. Our home has all brand new 2018 Pottery Barn style furnishings and is brand new to the rental market! 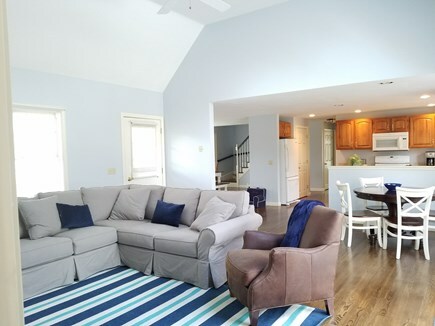 Our house is the perfect vacation home for two families of 4 or 5 that are looking to rent together! 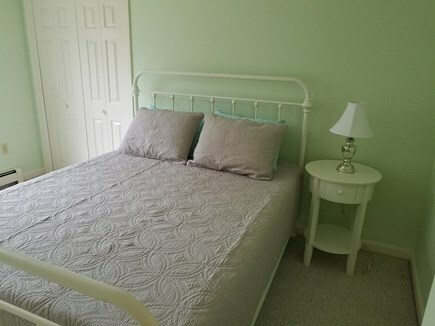 July 4th week 2019 still available!! There is an open floor plan kitchen/living area with cathedral ceiling and featuring a 65 inch TV with Klipsch soundbar (Xfinity service & Netflix) over the gas fireplace so you don't miss any Sox games! Central air system installed for 2019 season to keep you cool and comfortable on the hottest days! The downstairs layout features open floor plan living room/kitchen/dining room and sliding glass door out to the deck and back yard. First floor laundry with half bath and master bedroom/bath/walk-in closet are also on first floor. 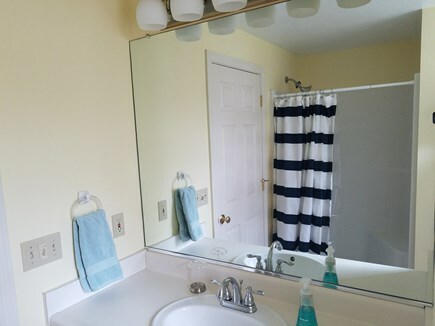 Upstairs, you will find 3 additional bedrooms and a full bath with tub. 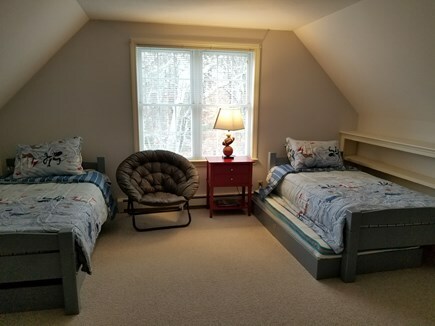 The kid's room has two twins with two trundles. The other two bedrooms have queen size beds. 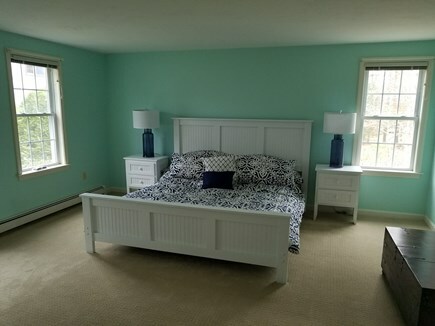 All new mattresses and bedding in all bedrooms. 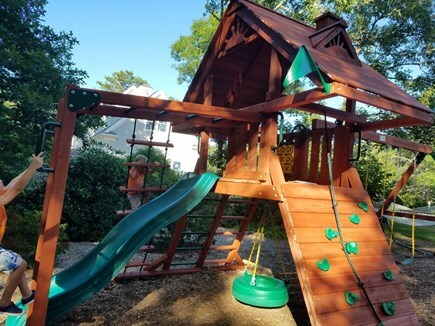 Back yard oasis features an outdoor shower, jungle gym, deck, and plenty of area to play and enjoy the beautiful Cape Cod summer weather. 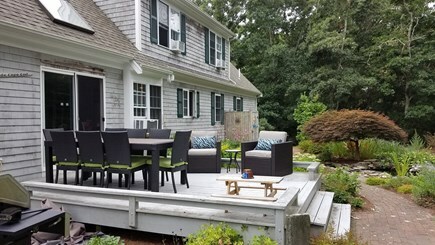 Outdoor dining table that seats up to 10 people as well as 2 club chairs for hanging out. Home includes usage of lots of kids toys and an adult's bike, so you can easily shuttle your family to the beach in the car and not have to worry about overcrowded parking lots. Just drop the family off at Mayflower, bring the car back to the house, and take a quick bike ride to the beach! Mayflower, Chapin's, Bayview, and Corporation Beaches are all close by, as is a playground, ice cream parlor, doughnut shop, Dennis Playhouse, and Dennis Market. We do recommend that you explore the beaches beyond Dennis as the Cape offers so many different types of beaches that you shouldn't miss out on! We have a Cape Cod guidebook put together with our recommendations on beaches, dining, and other activities not to be missed! No additional fees besides what is listed per week. Additional availability info: Check in at 4pm Saturday and departure by 10am the following Saturday morning. This is a Saturday to Saturday vacation rental. Additional pricing info: There is now a 12.45% tax, NOT included in base rate, State and local taxes of 12.45% will apply. 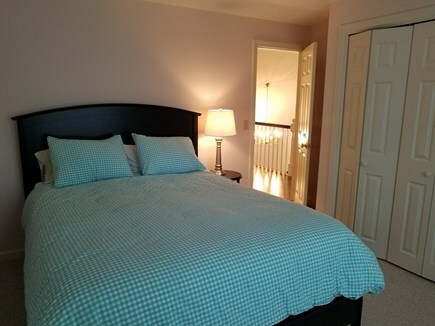 Master bedroom is on main floor with handicap accessible shower with seat. Beautiful House! We will definitely be renting this house again next year for our summer vacation! This was such a beautiful home, so clean and cozy..a home away from home. Our boys ages 9 & 11 enjoyed playing outside in the spacious yard and rode bikes around the neighborhood. 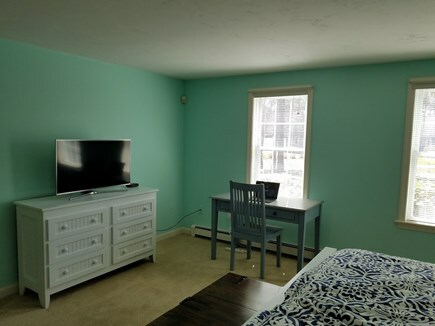 It’s in a great location..close to the beaches and shops. We can’t wait to rent this house again next summer for our family vacation. Beautiful home, quiet but convenient location ! We rent every year in Dennis for 6-7 years now but this year we needed something bigger, and, boy, were we happy we found this house! The house was the perfect size, it was so clean, and dealing with Caitlin was an absolute pleasure! 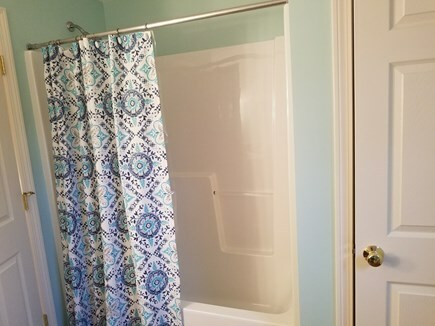 Anyone looking to rent this home will be extremely happy they did! We will be renting again next year! 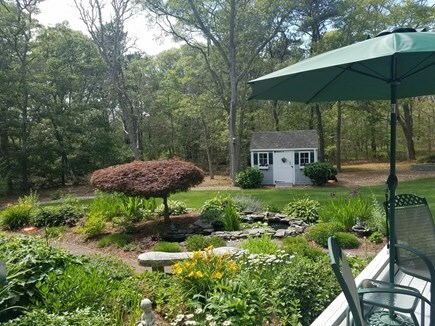 We are Massachusetts natives that just purchased this home in January of 2018. Our permanent residence is in the Metrowest area of Boston. My parents live in the Cape and we are happy to now have a home there as well! 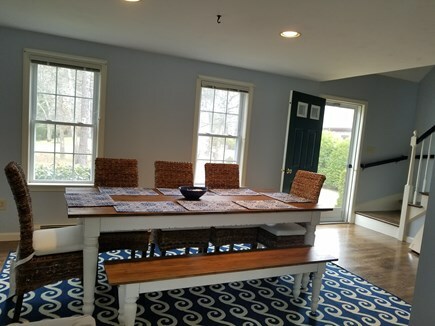 Since buying, we've repainted the entire interior, installed new carpeting in the master, and refinished and stained the hardwood floors throughout the house. We've decorated the house to make it feel like a real coastal retreat that will keep you content no matter the weather! The house is made for entertaining and would be happy to host you and your family. Cathedral living room ceiling, gas fireplace, beautiful, very private backyard outdoor space with seating and dining area with al fresco seating for up to 10! The cul de sac that the home resides on is incredibly quiet and is a safe area for kids to ride scooters and bikes. The backyard rolls into woods that eventually leads to marsh lands. Fun to explore! Kids toys and bikes available for usage. Old Dennis Village is considered a historic district, that's why you won't find any chain restaurants in this part of town! It's much more quiet than the Dennisport area, which is more commercial and densely populated. The beaches north of 6A are on the bay side of Cape Cod. When the tide goes out, it goes way, way out and leaves a gigantic hard packed beach to play on and explore. Water temps are mild and good for swimming. There's a great playground less than a mile from the house with an ice cream shop and homemade doughnut shop very close by. Chapin's Restaurant is a great stop to make after a day at the beach for cocktails or dinner.